It has been a long and frustrating road for David Cornell, but the Welshman is finally revelling in his role as the Cobblers’ number one goalkeeper. 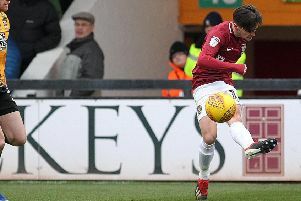 Signed by Rob Page from Swansea City in the summer of 2016, it is fair to say it has been a struggle for Cornell to win the approval of a succession of Cobblers managers. Barring brief spells in the team under both Page and then Justin Edinburgh, the 27-year-old has at various times over the past two-and-a-half years had to bide his time and play understudy to Adam Smith, Matt Ingram and Richard O’Donnell. But he was handed the gloves for the first game of the current season by then boss Dean Austin, and hasn’t looked back. Before the start of the current campaign, Cornell had made just 12 league starts in two years. This season, he has started all 27 Sky Bet League Two mathes, getting the nod from both Austin and now Keith Curle, and his appearances for the club in all competitions now top 50. Things are going well for him, and it seems Cornell is set fair to extend that run in the team, barring injury, through to the end of the campaign. Fresh from keeping his sixth clean sheet of the season in last Saturday’s 3-0 win over Carlisle United at the PTS Academy Stadium, Cornell spoke about how delighted he is to have at last been given an extended chance to show what he is capable of. Asked about the season to date, the Welshman said: “I have enjoyed it. “You ask any professional, and they just want to play games and have a consistent run in the team. “For a goalkeeper I think that is even more important, for your timing and getting your relationship with your back four or back three. “I have enjoyed it and, as I have said in the past, there is a reason I wanted to stay here, because I felt I had something to show and I hadn’t really had the chance to do that. “I love it here, I really enjoy working with the gaffer and with Dan (Watson, goalkeeping coach). Looking back to his two-year battle to nail down a regular place in the team, Cornell just sees at as all part of a goalkeeper’s life, and he now intends to do all he can to stay top goalkeeping dog at the PTS. “I was in and out, but I felt I had done okay, considering I come in after not playing for a couple of months,” said the shot-stopper. “But I come in every day and work hard, and hopefully I will pick up the benefits on the weekend and just keep going really. Like any goalkeeper, Cornell has had a couple of sticky moments this season, but on the whole his performances have been good and he believes he is capable of getting better and better. Asked if he is still learning his trade, the Swansea-born keeper said: “Oh yeah, 100 per cent. “I think I am a good age for a goalkeeper as well, and working with Dan (Watson, goalkeeping coach) every day, he is challenging me and pushing me. “I want to learn, and I don’t think there is anybody in this game that is not learning. “Everybody is learning and trying to become better players, and I am the same. Cornell is set to make league start number 28 this Saturday as the Cobblers head to Cambridge United (ko 3pm). Town go into the game buoyed by that win over Carlisle last weekend, but the U’s are also on a high having won their past two games under new boss, and former Cobblers manager, Colin Calderwood. And Cornell is anticipating another difficult game against a team Town have drawn twice with already this season. “They have won their last two, so it is going to be a tough game,” said Cornell.